on the Ladies and Gentlemen video! I'm Your Man: Set to the Leonard Cohen song of the same name, this irreverent animated film plays on the conventions and cliches of romance (4 min. 32 sec.). Poen: In this 1967 film, Leonard Cohen reads and re-reads a prose poem from his novel Beautiful Losers as diverse photographs flash by, juxtaposing word and image for a different effect each time (4 min. 35 sec.). A Kite Is a Victim: "Worthy, lyric and pure," a line from this early Cohen poem, describes this animated short and the poetry itself. Angel: A man, a woman and a dog take turns donning wings in this 1966 experimental film that both mocks and embodies the spirit of its decade. 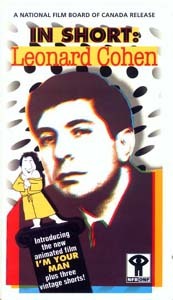 Featuring music and an uncredited appearance by Leonard Cohen (6 min. 55 sec. ).